While many apps are free and supported by in-app advertising, some of the more useful apps cost real money. In general, the more productive an app makes you, the more likely you are to have to pay for it. But there are exceptions! Many government agencies and non-profits offer apps that are both useful and free, so let’s take a look at some of those. We’ll start with the motherlode, the official app repository of Uncle Sam himself: USA.gov! From finding housing to staying in touch with astronauts, the US government is now in your back pocket (and not just to get at your wallet). Check out the list of available apps freshly updated for 2018. 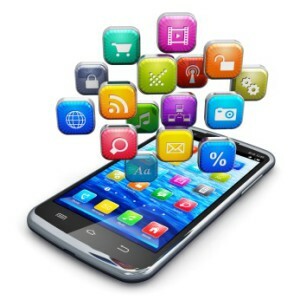 The CDC also has health-related apps worth checking out. There’s quite a few, ranging from a child development Milestone Tracker to a “Can I eat this?” app for travelers to foreign lands. Not to be outdone by the Feds, many states offer free helpful apps, too. They range from tourist guides to public transit and everything in between! Here’s New York and California. Other states don’t have their apps so well-organized. You’ll have to get your google on to find them. For you policy wonks, the National Conference of State Legislatures (NCSL) has a few state-specific apps to help you keep track of pending legislation. The American Red Cross has quite a few useful apps as well. They range from instructions in first aid (including first aid for pets!) 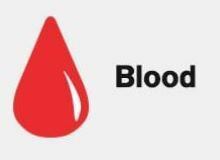 to emergency bulletins to scheduling blood donations. Find all the Red Cross apps listed in one place. Speaking of pets, the American Society for the Prevention of Cruelty to Animals (ASPCA) has an app to help you in pet emergencies, locate lost pets, and maintain your pet’s health records..
Now that you’ve got the doggos and fluffsters squared away, how about the birds? There’s a gaggle of birding apps out there, but one of the best happens also to be free! Merlin Bird ID is from the Cornell University Department Of Ornithology. It helps you identify and track birds by appearance, call, habitat, and season. It’s a great app for new birders, walking you through a five-step process of simple questions to identify the bird you’ve sighted. Or snap a photo of a mystery bird and Merlin will identify it! Listen to bird calls, get acquainted with the birds in your area, and learn which migratory visitors are just passing through. All for free! Plus, using Merlin sends birding data back to the ornithologists at Cornell, helping them track migratory patterns and changes in habitat. It’s available for iPhone and Android. But don’t get lost in the woods while you’re out there chasing down yellow-bellied sap-suckers! The clever app What3Words has divided the planet (yes, the whole planet) into 9’x9’ squares and assigned each individual square a three-word name. Once you know your three-word identifier you can use it to direct anyone to your location to within 9 feet away! Anywhere on the globe! It’s compatible with Google Maps, Apple Maps, Navmii, and Citymapper, and is increasingly being built in to many car navigation systems. Useful in developing countries without fixed postal addresses, What3Words is also great for having pinpointing your tent at a festival, connecting with your kids at a local festival, finding your friends at an arena, or arranging a group meetup in any big, crowded space. It’s available for Android and iPhone. We’ll end with an app that you should have on your phone just for emergencies. FireChat is texting app that communicates peer-to-peer via WiFi or Bluetooth. That means no internet connection or mobile phone connection is required. If there’s another device in range, FireChat will leapfrog your message (and any other FireChat messages that have used your device as a node) to that next device, and so forth, propagating messages outward like ripples in a pond, device-to-device. It’s called mesh networking, and in emergencies it can save your bacon. Of course, it only works if other devices are using FireChat (and on iPhones it requires AirDrop, so it’ll only work with iPhones 5 and up). Plus, it’s not exactly what you’d describe as “secure,” though that’s getting better as the app develops. But in a pinch, you never know when it might come in handy, and it doesn’t take up much space. Grab it for Android or iPhone from developer Open Garden. 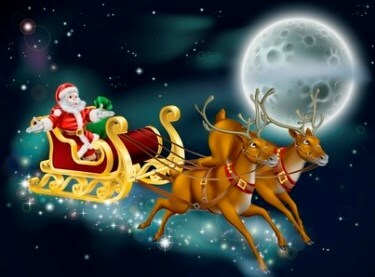 Finally, don’t forget to check with your local insurance agent or your insurance company to see if they have an app. If you have an emergency, you want to be able to report your claim quickly! September is National Preparedness Month – here’s one simple thing you can do: Download some free apps for your phone so that if you find yourself in an emergency, you are ready. Pass them along to your family members too, so you can all be informed. Here are a few suggestions. The free FEMA app is a must. One great new feature is that you can get weather alerts from the National Weather Service for up to five locations across the nation. That allows you to follow severe weather alerts for friends and family located anywhere in the country – even if your phone is not located in the area. The app is available in English but it will default to Spanish if those who have set that as the default language. It can be downloaded from the App Store for Apple devices and Google Play for Android devices. The new weather alert feature adds to the app’s existing features: a customizable checklist of emergency supplies, maps of open shelters and Disaster Recovery Centers, and tips on how to survive natural and man-made disasters. 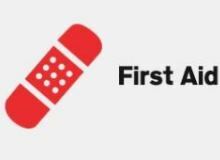 First Aid – Get instant access to information on handling the most common first aid emergencies. 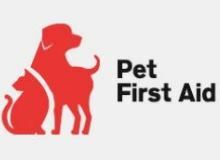 Pet First Aid – Be prepared to help your furry friends with veterinary advice for everyday emergencies. Blood – Schedule blood donation appointments, track total donations and earn rewards as you help us meet the constant need for blood. They also have emergency apps for tornado, hurricane, wildfire, flood, earthquake and general emergencies, along with a few apps for kids. With the rarity of events, tornadoes are not top of mind awareness for people when bad weather looms. Get the free Red Cross Tornado app to have everything you need to know to prepare for a tornado in the palm of your hand. To download: text “GETNADO” to 90999 or search “Red Cross Tornado” in the Apple App Store or Google Play. Step-by-step instructions to help you know what-to-do even if the cell towers and TVs are down. 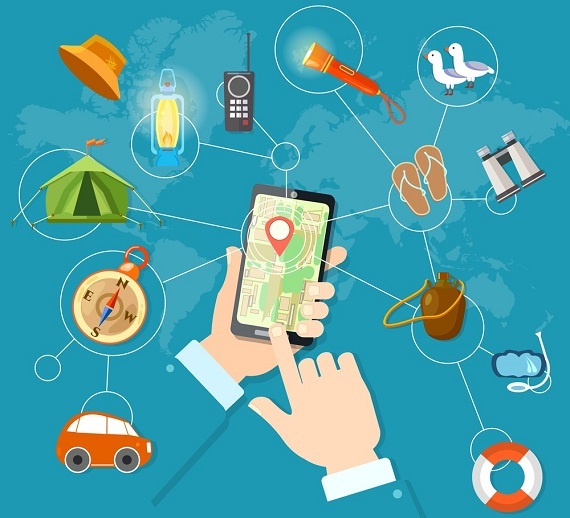 Prioritized actions for before, during, and after requires no mobile connectivity. Audible siren that automatically goes off even if app is closed when NOAA issues a TORNADO WARNING helping to reduce the chance of sleeping through an actual warning. Push notification sent when a WARNING expires – especially important if power goes out while you or your family are in your safe room. Info on how to assemble an emergency kit for your family in the event of power outage or evacuation and how to make an emergency plan. Info on the difference between a tornado warning and a tornado alert. Learn how to deal with food and water impacted by floods and power outages. If you had to evacuate your home in the next hour or two, would you know what to do? An hour or two gives you a bit of a head start – often, people caught in emergencies have less time to prepare than that. September is National Preparedness Month – during the month, we’ll offer a few suggestions for preparing for the unexpected. Today, we’ll highlight a few apps that might help in the event of an emergency. 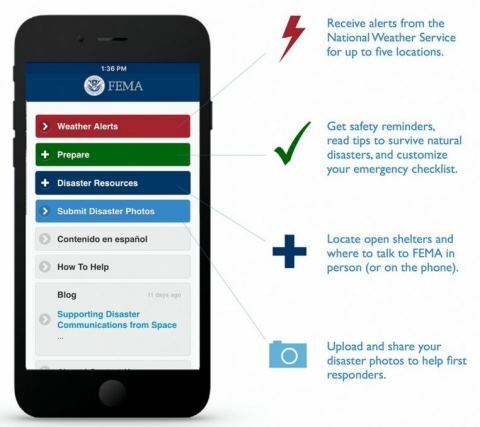 The FEMA App (smartphone app for mobile devices) contains disaster safety tips, an interactive emergency kit list, emergency meeting location information, and a map with open shelters and open FEMA Disaster Recovery Centers (DRCs). Also has Disaster Reporter feature allowing you to take and submit GPS photo reports of disasters so they can be displayed on a public map for others to view. Red Cross has a great suite of free emergency apps. These include apps for weather related disasters such as tornadoes, earthquakes, hurricanes, and wildfires , with state-by-state news, tips, and more. They also have apps for first aid and finding shelter in an emergency.